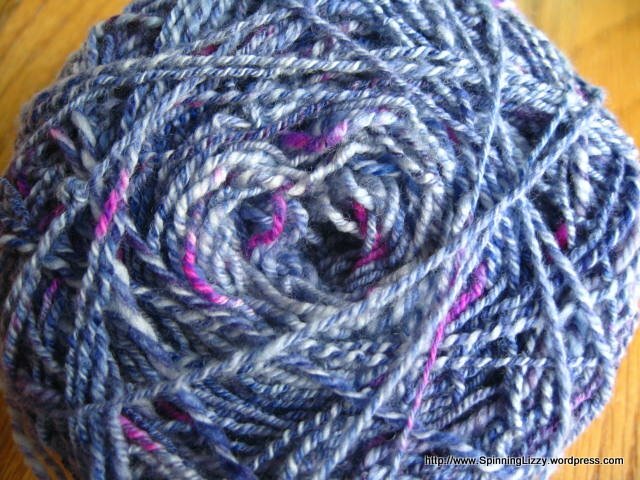 The Ashford Knitters loom is one that was not on my list of rigid-heddle considerations. 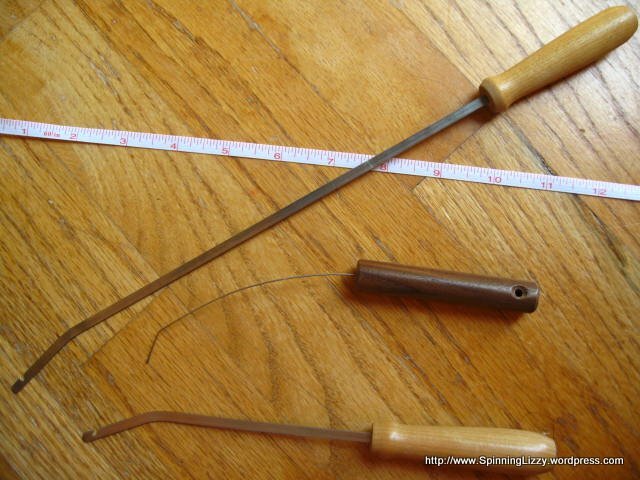 I had seen pictures of the blue plasticky ratchets and pawls, seen that the wood was not maple, knew that the marketing was aimed at luring knitters down the weaving slope (I had already slipped, so what was the point?) and never gave it another thought. 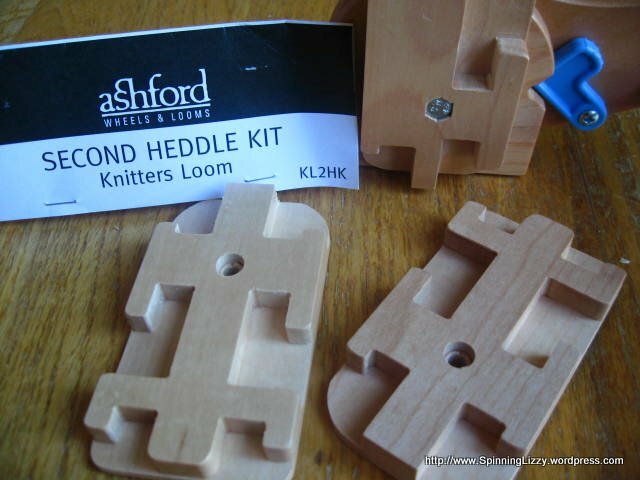 I discovered that Ashford recently released a second-heddle upgrade kit. 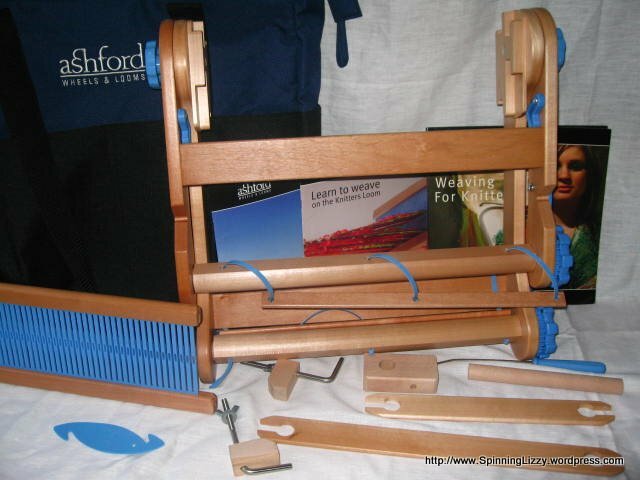 My loom came with all the original accessories, plus a carrying tote. The tote bag is very well designed; heavy-duty and well-padded, with long shoulder straps (not adjustable, though), and handy side pockets with some sewn thoughtfully narrower to accomodate long thin objects you might need to have on hand, like swords and stick shuttles. 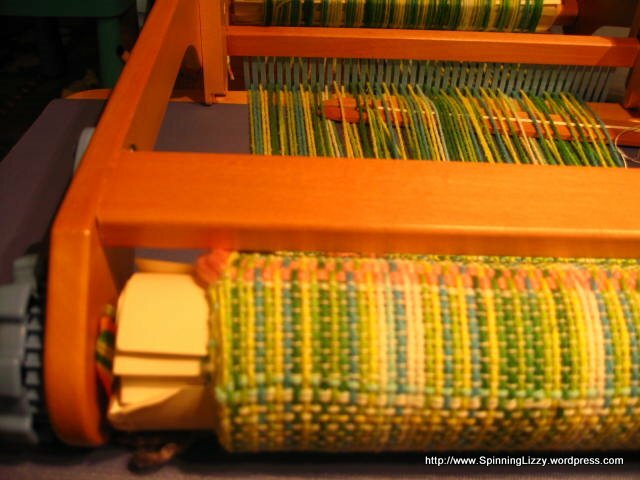 The bag is closely fitted to the loom, with enough room for a book (or two) and some yarn. 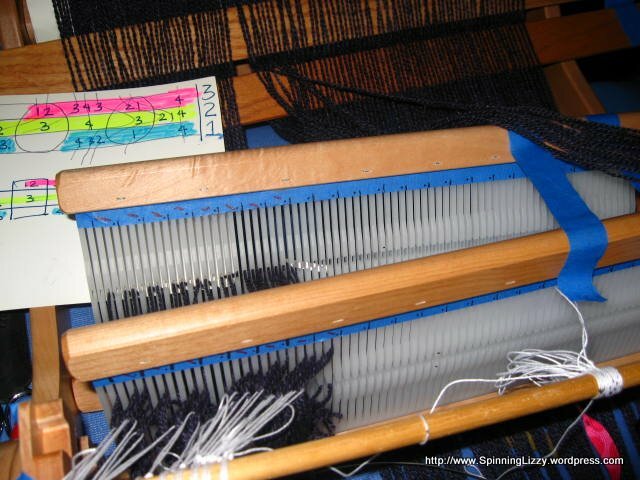 I did find that the 7.5-dent heddle it came with to measure 11-5/8″ in length, and can’t help feeling a tad cheated of the last 3/8″. I suppose 12″ sounds better than 11″ for marketing purposes. 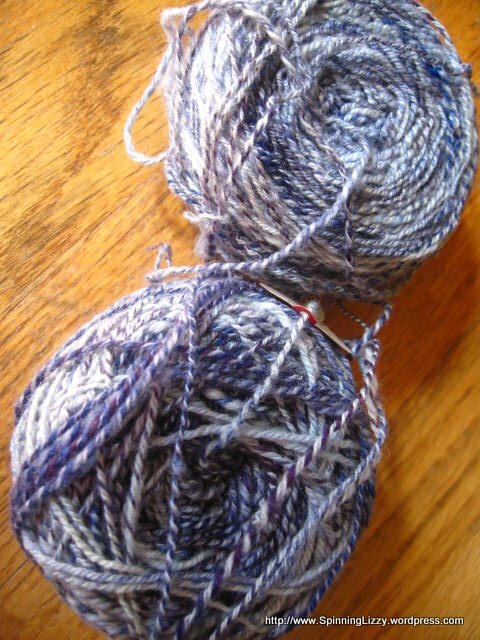 While I waited for the second heddle upgrade kit and additional heddle reeds I ordered to arrive, I put on a first warp. 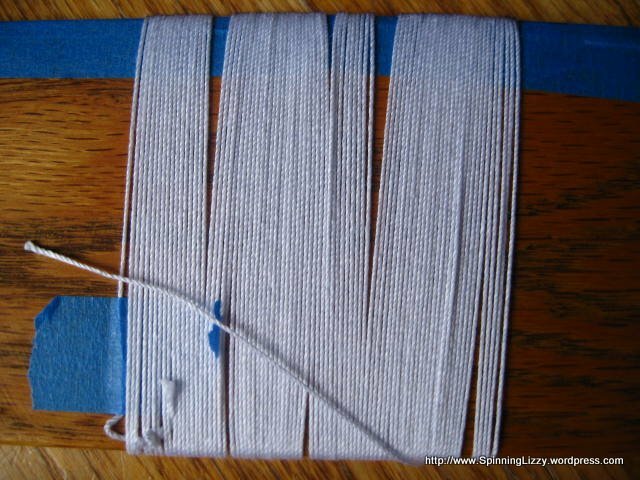 I used the shoestring method of speed-warping by Nadine Sanders,The Singing Weaver, which contributes a little bulk to the front. 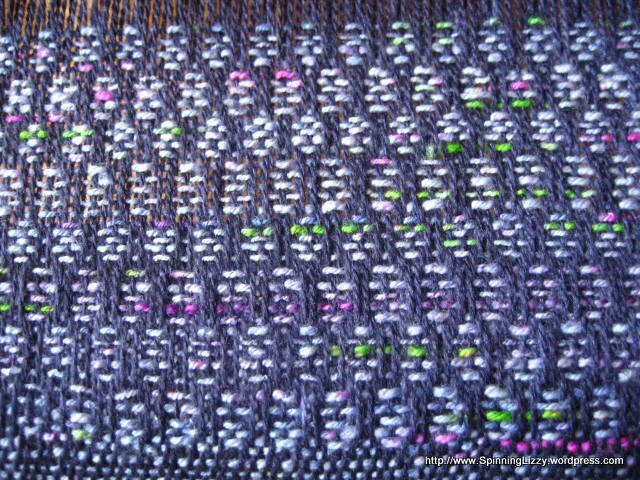 The brace on the other end is farther away from the back beam, so the cloth beam will be the limiting factor to the length of the warp. 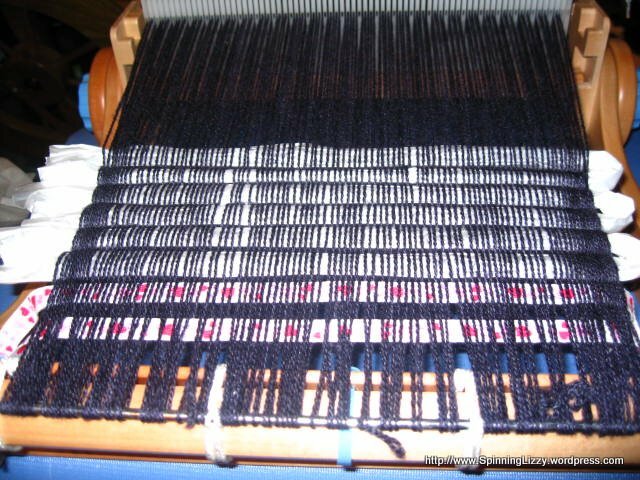 Thinking “scarf”, rather than “valance” is probably an good idea for warp length on this loom. One thing I did not like were the blue plastic ties attached to the front and back beams. 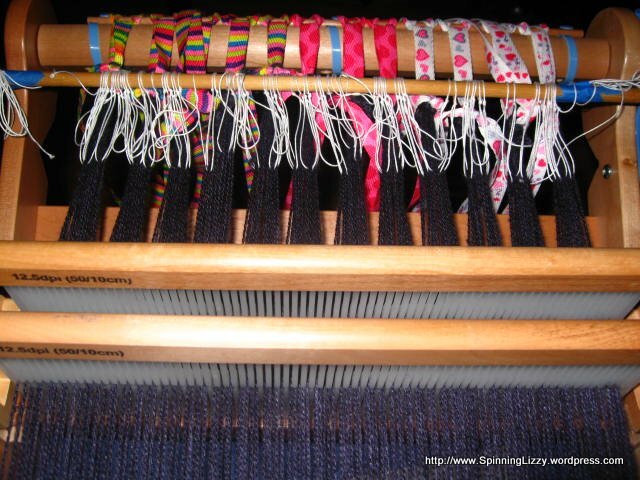 They are very springy, and push the attached stick away from the beam, making the warping process difficult. 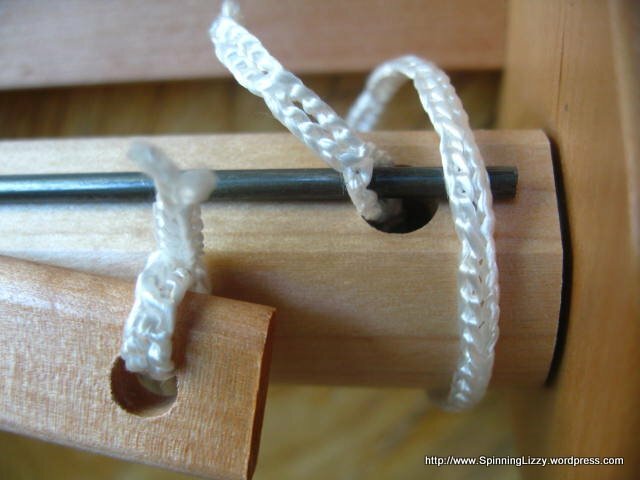 However, when I tried to substitute texsolv, I found I could not thread it in the holes of both the beam and the stick. 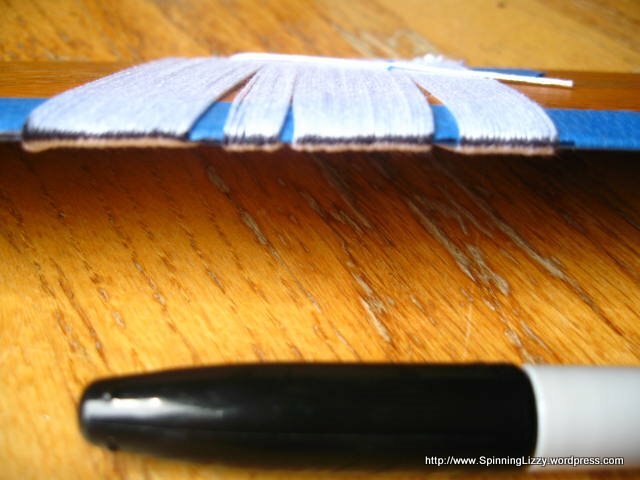 When I attempted a work-around with a metal rod inserted at the beam to hold the texsolv, I found the texsolv added substantial bulk when winding up the stick. 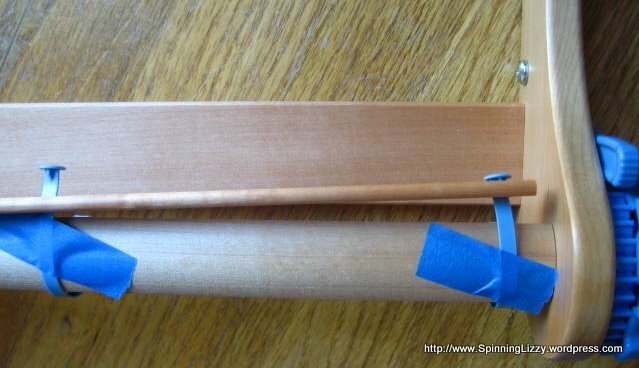 When I tried to exchange the stick for a second rod, I discovered that the combination of the stick and plastic ties would wind around the beam until the stick sat perfectly on the flat side of the beam. 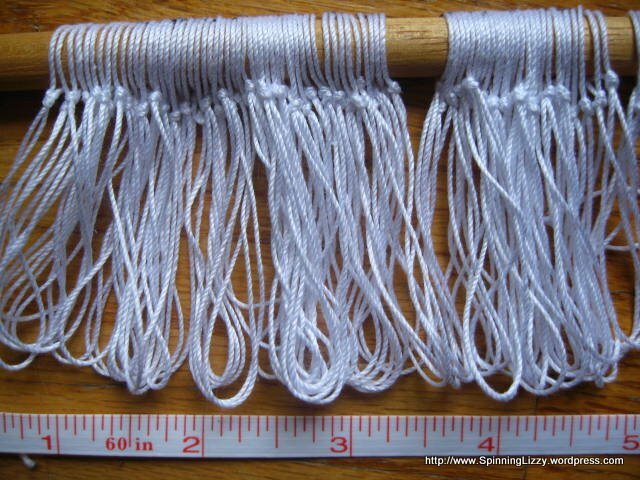 So, I reverted to the plastic ties, which turn out to be a marvel of thought and economy of space. 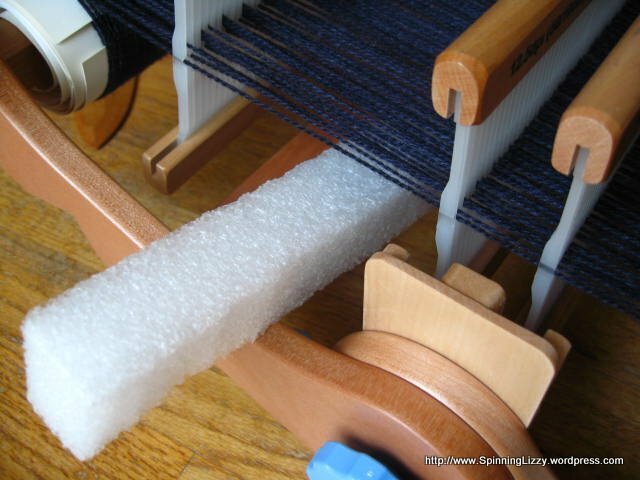 In fact, as I started to use this loom, again and again I marvelled at the insightful engineering design at every turn. 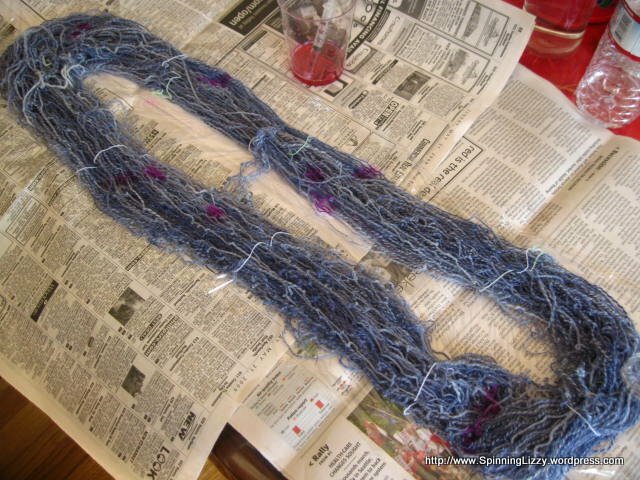 As to the springyness of the blue plastic ties, I used a bit of blue painter’s tape to tame them. 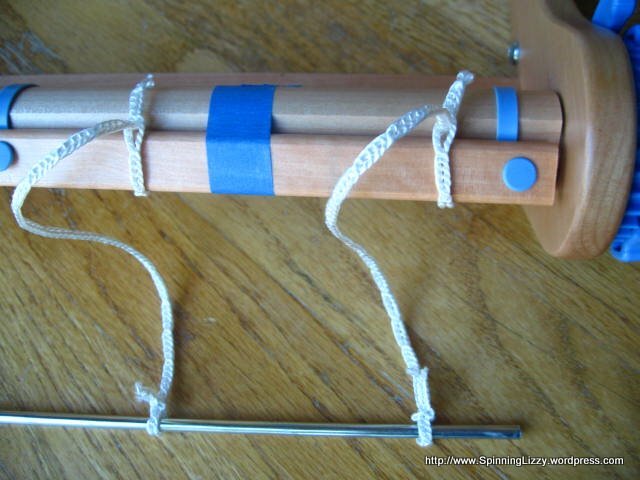 I wanted to reduce the bulk of shoestrings in the front, so attached a metal rod to the wood stick with texsolv. 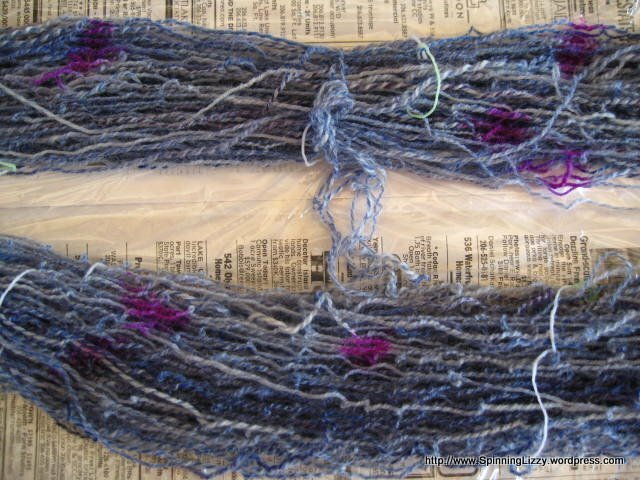 I would thread the uncut ends of warp onto the rod to save myself the time of tying on and the bulk of knots — even though that would entail winding onto the front beam, threading the heddles, tying on at the back, and the extra step of re-winding the warp to the back beam. 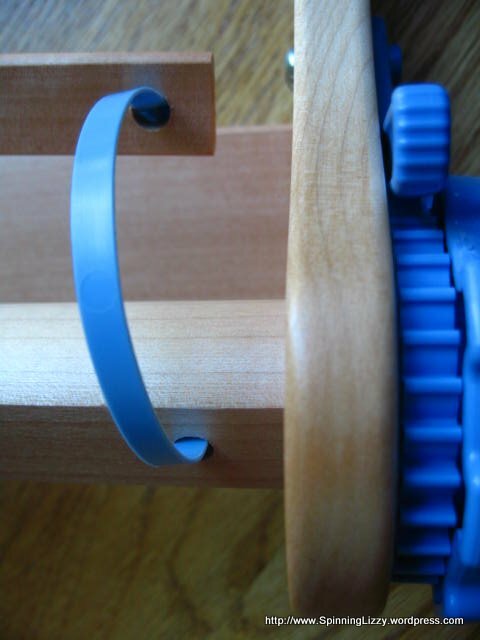 Another example of the Ashford engineering thoughtfullness can be seen in the pair of blue, plastic, L-shaped pieces, found on both sides of the loom just behind the heddle blocks. 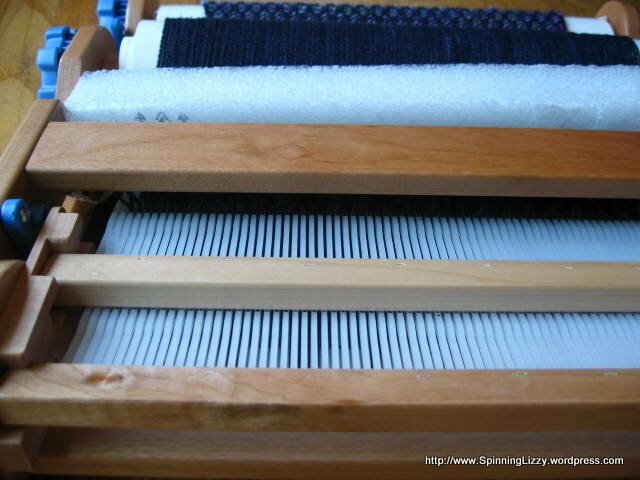 One is pictured below with the single and double heddle blocks. 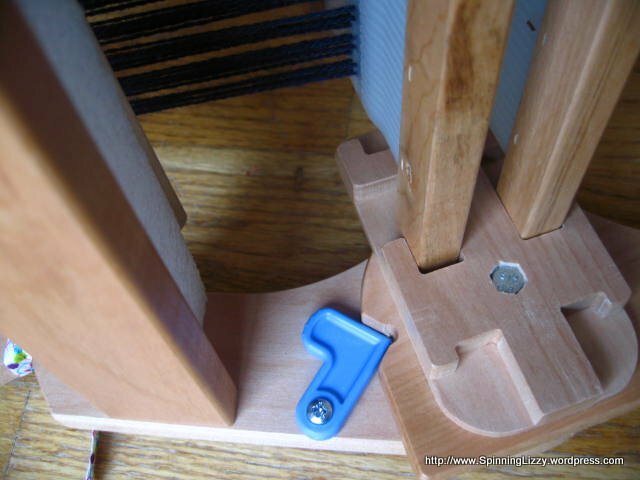 These two L-shaped pieces prop the back beam so it’s up at an angle from the rest of the loom, and so improves the shed. 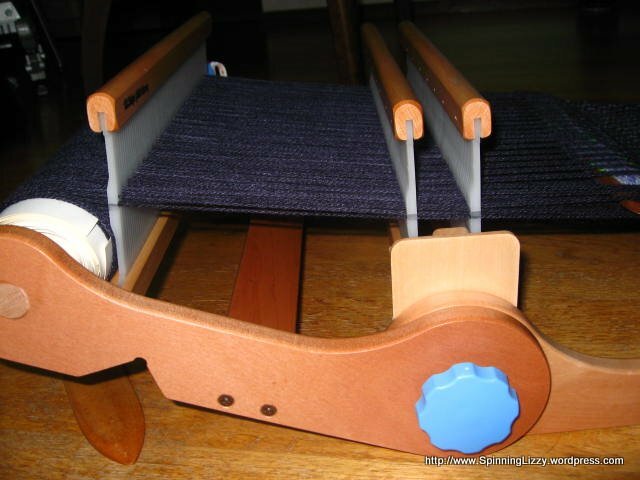 It was quick to install the second heddles on the Knitters Loom; a few taps with a hammer to remove the bolts from the original heddle blocks and put them into the dual ones was all it took. 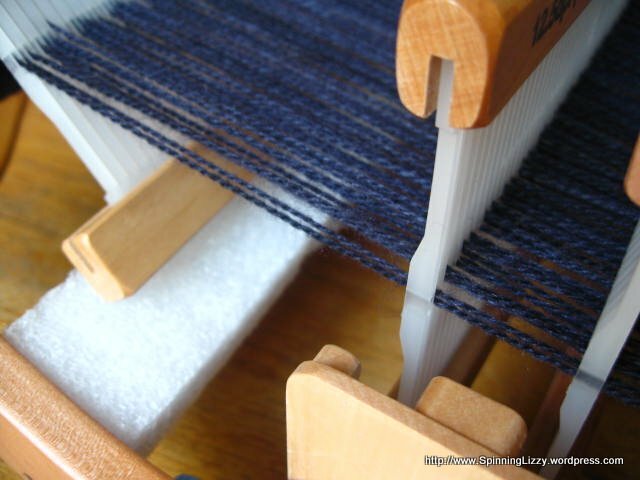 The loom is easy to fold with the weaving in place; put the weft-filled shuttle between a shed to lock it in place, put the heddle in the “travel” position (the lowest notch in the heddle block), then fold. 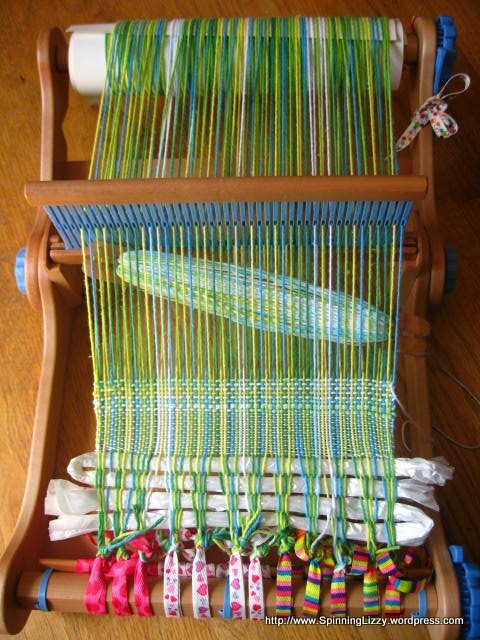 I found the loom to be sturdy, extremely portable, and just plain loveable — I’m crazy about this loom! 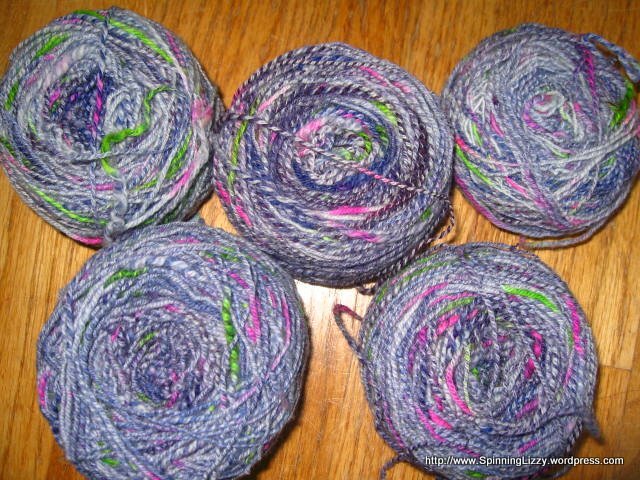 It’s lightweight, without being a lightweight, if you know what I mean.